Ecola Falls is east of Portland. On I-84, access to Ecola Falls is a left lane exit appr. To reach Ecola Falls climb up the switchback path (1 mile) to the top of Multnomah Falls. 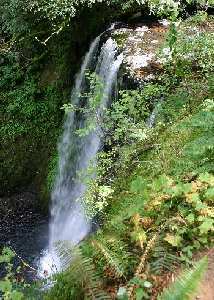 Ecola Falls is a short distance past Wiesendanger Falls.